The rules of 25 Modifier usage with other modifiers | Medical billing cpt modifiers and list of medicare modifiers. It may be necessary to indicate that on the day a procedure or service identified by a CPT code was performed, the patient's condition required a significant, separately identifiable E/M service above and beyond the other service provided or beyond the usual preoperative and postoperative care associated with the procedure that was performed. A significant, separately identifiable E/M service is defined or substantiated by documentation that satisfies the relevant criteria for the respective E/M service to be reported (see Evaluation and Management Services Guidelines for instructions on determining level of E/M service). The E/M service may be prompted by the symptom or condition for which the procedure and/or service was provided. As such, different diagnoses are not required for reporting of the E/M services on the same date. This circumstance may be reported by adding the modifier 25 to the appropriate level of E/M service. This modifier may be used to indicate that an E/M service or eye exam, which is performed on the same day as a minor surgery (000 or 010 global days) and which is performed by the surgeon, is significant and separately identifiable from the usual work associated with the surgery. This modifier should not be submitted with E/M codes that are explicitly for new patients only: CPT codes 92002, 92004, 99201-99205, 99321-99323 and 99341-99345. These codes are listed as new patient codes and are automatically excluded from the global surgery package. They are reimbursed separately from surgical procedure and no modifier is required. New patient CPT codes required CPT modifier 25 when a separately identifiable E/M service is performed the same day as chemotherapy or non-chemotherapy infusions or injections as these are not considered surgery. No supporting documentation is required with the claim when this modifier is submitted. A different ICD-10 code from the one submitted with the minor surgery is not required with the E/M code. The diagnosis for the E/M service and the other procedure may be the same or different. This modifier may be used to indicate that an E/M service was provided on the same day as another procedure that would normally bundle under the National Correct Coding Initiative (NCCI). In this situation, CPT modifier 25 signifies that the E/M service was performed for a reason unrelated to the other procedure. The physician may need to indicate that on the day a procedure or service identified by a CPT code was performed, the patient's condition required a significant, separately identifiable E/M service above and beyond the other service provided or beyond the usual preoperative and postoperative care associated with the procedure that was performed. * The E/M service may be prompted by the symptom or condition for which the procedure and/or service was provided. * Different diagnoses are not required for reporting the E/M services on the same date. This circumstance may be reported by adding the CPT modifier 25 to the appropriate level of E/M service. Note: This modifier is not used to report an E/M service that resulted in a decision to perform surgery. See CPT modifier 57. A physician other than the physician performing the procedure. Documentation shows the amount of work performed is consistent with that normally performed with the procedure. * The patient’s condition required a significant, identifiable E/M service above and beyond the other service provided or services beyond the usual preoperative and postoperative care associated with the procedure that was performed. * These circumstances may be reported by adding the 25 modifier to the appropriate level of the E/M service. 1. The phrase, “the patient’s condition required” is extremely important. In other words, it was medically necessary for the patient to have these extra services on the same day that another procedure or service was performed. 2. The phrase, “a significant, separately identifiable E/M service above and beyond” the other service provided indicates that this extra service was clearly different from the other procedure or service that was performed. 3. The phrase, “services beyond the usual preoperative and postoperative care” associated with the procedure emphasizes the fact that all procedures as defined in the Resource-Based Relative Value Scale (RBRVS) system of reimbursement that Medicare uses include a certain amount of preoperative and postoperative care in the reimbursement package. The 25 modifier should be used if extra work beyond the usual is performed. A good standard for judging whether the 25 modifier should be used is: If a physician in the same specialty area would agree after reading the clinical record that extra preoperative and/or postoperative work beyond what is usually performed with that service was performed, then it is proper to use the 25 modifier to indicate that extra work. To document the extra work performed, the clinical record should clearly indicate that extra or unusual work. Why is the physician seeing the patient? o If the patient exhibits symptoms from which the physician diagnoses the condition and begins treatment by performing a minor procedure or an endoscopy on that same day, modifier 25 should be added to the correct level of E/M service. o If the patient is present for the minor procedure or endoscopy only, modifier 25 does not apply. o If the E/M service was to familiarize the patient with the minor procedure or endoscopy immediately before the procedure, modifier 25 does not apply. * If the E/M service is related to the decision to perform a major procedure (90-day global), modifier 25 is not appropriate. The correct modifier is modifier 57, decision for surgery. * When determining the level of visit to bill when modifier 25 is used, physicians should consider only the content and time associated with the separate E/M service, not the content or time of the procedure. Example: A patient reports for pulmonary function testing in the morning and then attends the hypertension clinic in the afternoon. The pulmonary function tests are reported without an E/M service code. However, an E/M service code with the modifier –25 appended should be reported to indicate that the afternoon hypertension clinic visit was not related to the pulmonary function testing. Example #1: A patient is seen in the ED with complaint of a rapid heartbeat. A 12-lead ECG is performed. Example #2: A patient is seen in the ED after a fall. Lacerations sustained from the fall are repaired and radiological x-rays are performed. * The clinical edit is eligible for a modifier bypass (e.g. per edit rationale, CCI modifier indicator = “1”, etc.). * The modifier and the code have been submitted in accordance with AMA CPT book guidelines, CPT Assistant guidelines, CMS/NCCI Policy Manual guidelines, and any applicable specialty society guidelines. * The procedure code is eligible for separate reimbursement according to the status indicators on the CMS fee schedule for the relevant provider type (physician fee schedule, ASC, OPPS, etc). * The medical records documentation supports the appropriate use of modifier 25. All of the required key components of the E/M service with modifier 25 appended must be documented in the medical record. The submission of modifier -25 appended to a procedure code indicates that documentation is available in the patient’s records which will support the distinct, significant, separately identifiable nature of the evaluation and management service submitted with modifier -25, and that these records will be provided in a timely manner for review upon request. All surgical procedures and some non-surgical procedural services include a certain degree of physician involvement or supervision, pre-service work, and post-service work which is integral to that service. For those procedures and services a separate E/M service is not normally reimbursed. However, a separate E/M service may be considered for reimbursement if the patient’s condition required services above and beyond the usual care associated with the procedure or service provided and modifier -25 is appended to the E/M code. None of the usual pre-service, intraservice, or post-service work associated with the other procedure(s) performed on the same day may be included in the documentation to support the key components of the significant, separately identifiable E/M service. Policy Manual, chapter one, also addresses that minor surgical procedures include the decision for surgery E/M service; E/M of a second, unrelated problem would be eligible for consideration of modifier 25. · Modifier –25 applies only to E/M service codes and then only when an E/M service was provided on the same date as a diagnostic medical/surgical and/or therapeutic medical/surgical procedure(s). In other words, modifier –25 does not apply when no diagnostic medical/surgical and/or therapeutic medical/surgical procedure(s) is performed. · It is not necessary that the procedure and the E/M service be provided by the same physician/practitioner for the modifier –25 to apply in the facility setting. It is appropriate to append modifier –25 to the qualifying E/M service code whether or not the E/M and procedure were provided by the same professional. · The diagnosis associated with the E/M service does not need to be different than that for which the diagnostic medical/surgical and/or therapeutic medical/surgical procedure(s) was provided. · It is appropriate to append modifier –25 to ED codes 99281-99285 when these services lead to a decision to perform diagnostic medical/surgical and/or therapeutic medical/surgical procedure(s). ** Two separate visits occurred at different times of day and for unrelated problems that could not be anticipated or addressed during the same encounter. o For example, a scheduled office visit occurs in the morning for upper respiratory infection and 4 hours later an unscheduled visit for a fall with injured knee. o Modifier 25 would be appended to the second visit. Additional information regarding the two separate times should be supplied in box 19 of the claim form, or the equivalent field in the electronic claims submission process. o Note: If the patient mentions the second problem at the first visit, and the provider asks the patient to return later in the day for the assessment of the second problem, then all evaluation and management services provided that day would be included in the selection of a single E/M service code. 1. What is the definition of a “Modifier”* A modifier is a two-digit numeric or alphanumeric character reported with a HCPCS code, when appropriate. Modifiers are designed to give Medicare and commercial payers additional information needed to process a claim. This includes HCPCS Level I (Physicians’ Current Procedural Terminology [CPT®]) and HCPCS Level II codes. 2. What are the uses of Modifiers? According to the 2015 CPT© professional Code Book, a modifier provides the means to report or indicate that a service or procedure that has been performed had been altered by some specific circumstances but not changed in its definition or code. Modifiers also enable health care professionals to effectively respond to payment policy requirements established by other entities. 3. What is Modifier 25? Modifier-25 is used for an unrelated evaluation and management (E/M) by the same provider or other qualified health care professional that is a significant, separately identifiable services performed on the same day as another procedure or service. The physician must show, by documentation in the medical record, that on the day a procedure was performed, the patient’s condition required a separately identifiable E/M service above and beyond the usual care associated with the procedure that was performed. A significant, separately identifiable E/M service is substantiated by documentation that satisfies the relevant criteria for the respective E/M service to be reported. 4. What are some of the appropriate usages of Modifier 25? • Use modifier 25 on an E/M service when performed at the same session as a preventive care visit when a significant, separately identifiable E/M service is performed in addition to the preventive care. • The E/M service must be carried out for a nonpreventive clinical reason, and the ICD-9- CM code(s) for the E/M service should clearly indicate the nonpreventive nature of the E/M service. • Attach modifier 25 to the E/M code representing a significant, separately identifiable service performed on the same day as routine foot care. The visit must be medically necessary. • Modifier 25 indicates that on the day of a procedure, the patient's condition required a significant, separately identifiable E/M service, above and beyond the usual pre and postoperative care associated with the procedure or service performed. • Use Modifier 25 with the appropriate level of E/M service. • The procedure performed has a global period listed on the Medicare Fee Schedule Relative Value File. • Use modifier 25 when the E/M service is separate from that required for the procedure and a clearly documented, distinct and significantly identifiable service was rendered. 5. Can you use Modifier 25 for an unexpected incident or unplanned reason? If, during the course of the preventive medicine visit, an abnormality or preexisting problem is addressed, physicians may receive payment for that part of the visit; however, the problem should be significant enough to warrant additional work that meets the requirements of at least a problem oriented E&M visit. In this case, that part of the visit may be billed by using the appropriate office/outpatient service code with the modifier 25 (significant, separately identifiable E&M service by the same physician, same day) along with the preventive medicine code. The most common use of Modifier 25 associated to a THSteps checkup is when an immunization or vaccination is administered. Modifier 25 is used to indicate that the immunization or vaccination is an E/M service that was performed at the same session as a preventive care visit. The use of Modifier 25 appended to the claim form shows (along with documentation in the medical record) that a significant, separately identifiable E/M service was performed in addition to the checkup. The use of modifier 25 has specific requirements. • The E/M service must be significant. The problem must warrant physician work that is medically necessary. This can be defined as a problem that requires treatment with a prescription or a problem that would require the patient or family to return for another visit to address it. A minor problem or concern would not warrant the billing of an E/M-25 service. • The E/M service must be separate. The problem must be distinct from the other E/M service provided (e.g., preventive medicine) or the procedure being completed. Separate documentation for the E/M-25 problem is helpful in supporting the use of modifier 25 and especially important to support any necessary denial appeal. • The E/M service must be provided on the same day as the other procedure or E/M service. This may be at the same encounter or a separate encounter on the same day. • Modifier 25 should always be attached to the E/M code. If provided with a preventive medicine visit, it should be attached to the established office E/M code (99211–99215). • The separately billed E/M service must meet documentation requirements for the code level selected. It will sometimes be based on time spent counseling and coordinating care for chronic problems. evaluation and management (E/M) work that goes above and beyond the physician work normally associated with a preventive medicine service or a minor surgical procedure is additionally billable. • Using modifier 25 to report an E/M service that resulted in the decision to perform major surgery (see modifier 57). • Billing an E/M service with modifier 25 when a physician performs ventilation management in addition to an E/M service. • Using modifier 25 on an E/M service performed on a different day than the procedure. • Using modifier 25 on the office visit E/M level of service code when on the same day a minor procedure (e.g., an endometrial biopsy) was performed, when the patient’s trip to the office was strictly for the minor procedure (e.g., biopsy). 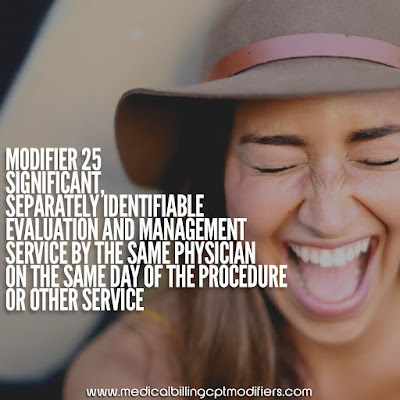 Modifier 25 is appended to an Evaluation and Management (E&M) service (never to a procedure code) to indicate a significant, separately identifiable evaluation and management (E/M) service by the same physician on the same day of a procedure or other service was provided. Coding for well visits is much trickier. Well visit codes will be shown as 9938x or 9939x, where x is again 1-5 but now represents the age of the patient. “Typical” resources needed are fairly consistent from age to age so CPT E/M codes define a “typical minimum” that must be done. • When there are “expert recommendations” that certain procedures are necessary as the “standard of care.” There are MANY of these, such as immunizations, developmental assessment, hearing and visions screening tests, anemia and cholesterol blood tests, and screening for health and behavior problems. Each of these “recommendations” has their own unique CPT codes as they require a different set and level of resources. These CAN be predicted ahead of time. • When there are “additional concerns” during the well visit NOT “typically” part of a well visit. o The concern may be expressed by the parent/patient or identified during the visit by the provider or by screening tests/questionnaires. o The concern may be a new problem or follow-up on an existing problem. o Since the resources required to deal with the concern are similar in nature to those needed for a separate acute, chronic, and follow-up visits, the acute visit codes 9920x and 9921x are used. o The “-25 modifier” is added to the end of the acute code to show that, while at a well visit, a potential concern was identified that required extra resources. o The appropriate “level” of acute code is chosen that matches the amount of additional “resources” required. o The modified code is only billed if the concern and the extra work meet certain strict criteria so that this modified code is not misused/overused. Most of the time you CAN NOT predict ahead if a “-25 modifier” code will be used. According to the Procedure codebook, it is appropriate to bill for both preventive services and evaluation and management (E&M) services during the same visit only when significant additional services or counseling are required. If the provider provides both a service or procedure and an evaluation and management (E&M) on the same day, it must be significant, separate, and identifiable. Documentation must support both services and show that the E&M was above and beyond the service or procedure provided. When preventive care codes 99381-99387 or 99391-99397 are billed with office visit codes 99201-99203 or 99211-99213 (with modifier 25 on the office visit code) chart notes are not needed; both codes will be allowed. For all other preventive care & office visit code combinations (or these combinations billed without modifier 25), chart notes are required for consideration of both codes. • The system will stop the claim for review to allow the adjudicator to determine if chart notes are attached to the claim. • If there are no chart notes submitted, the charges for the medical office visit will be considered provider write-off. If notes are attached, the notes will be reviewed and, based on the content, a determination will be made whether or not the office visit is appropriate. • Claims received as rebills with notes will be forwarded to a Claims Research Analyst. • A patient who has a history of hypertension is scheduled for a routine physical. You make brief mention of the hypertension and re-fill the patient’s prescription. • During an annual gynecological exam, a patient mentions that she is having hot flashes, and you order blood work to check hormone level. • A patient is scheduled for a routine physical with a history of hypertension, and upon examination, you discover that the patient’s blood pressure is extremely high. The patient says he is having lightheadedness and ringing in the ears. You take measures to reduce the blood pressure and counsel the patient on how to monitor the condition. • During an annual gynecological exam, you find a lump in a patient’s breast and order additional blood work and radiological procedures. You also take additional time to go over treatment options with the patient. Insurance allows modifier 25 to be used by the provider when the patient's condition requires a significant, separately identifiable E/M service above and beyond the usuasl pre and post procedure work on the same day as a procedure or other services. Modifier 57 to be used by the provider when an E/M service results in the initiall decision to perform a major surgicial procedure. Modifiers -25 and -57 are used to ensure appropriate reimbursement for the evaluation and management (E&M) service as well as a procedure in the office, or seeing a patient and determining to perform surgery within the next 24 hours. These modifiers should be reported with E&M services only. Without the use of these modifiers, your E&M visits may be denied. Modifier -25 can be added to the E&M code for a procedure that has a 0- or 10-day global period. Modifier -25 can be added to the E&M code when a decision for surgery has been made for a procedure that has a 0- or 10-day global period. Append modifier -57 to an E&M code when a decision for surgery is made the day before or the day of the surgery for a procedure with a 90-day global period. This applies to Medicare claims. Commercial carriers have their own separate edits. You will need to check with individual carriers for the usage of these modifiers. If an E&M service is done within 24 hours before a major surgery that has a 90-day global period, append a -57 modifier. Modifier -57 should not be used if a decision for surgery previously was reached and this E&M visit is for the purpose of a pre-operative history and physical. This guide is being published to illustrate the situation when more than one modifier might be needed to inform us that a visit was done with a procedure on the same day during the post operative period of another major procedure. A provider is billing for an evaluation and management service (E/M) performed on the same date as a minor surgery but during the global period of a major surgery (for example a total hip replacement) done a month prior that has 90 global days. The E/M service is included in the major and minor surgeries and is usually not covered separately. When a visit occurs on the same day as a surgery with '0' global days and within the global period of another surgery and the visit is unrelated to both surgeries, CPT modifiers 24 and 25 must be submitted on the visit code. CPT modifier 25: The E/M service, performed on the same day as a minor surgery (000 or 010 global days) is significant and separately identifiable from the usual work associated with the surgery. Documentation in the patient’s medical record must support the use of this modifier. CPT modifier 24: The E/M service was performed during the postoperative period of a major surgery but for a reason unrelated to the original procedure. If the diagnosis codes is not a clear indication that the visit was unrelated to the surgery, supporting documentation specifying the 'reason' the visit was unrelated must be submitted with the claim. If the criteria for CPT modifiers 24 and 25 were met, the claim should be submitted as 99213-2524. The AMA CPT Manual defines modifiers that may be appended to HCPCS/CPT codes to provide additional information about the services rendered. Modifiers may be appended to HCPCS/CPT codes only if the clinical circumstances justify the use of the modifier. It is very important that our providers bill using the appropriate CPT/HCPCS and Modifiers. For example, when billing for separate identifiable services you must bill with the modifiers listed below in order to be eligible for reimbursement. 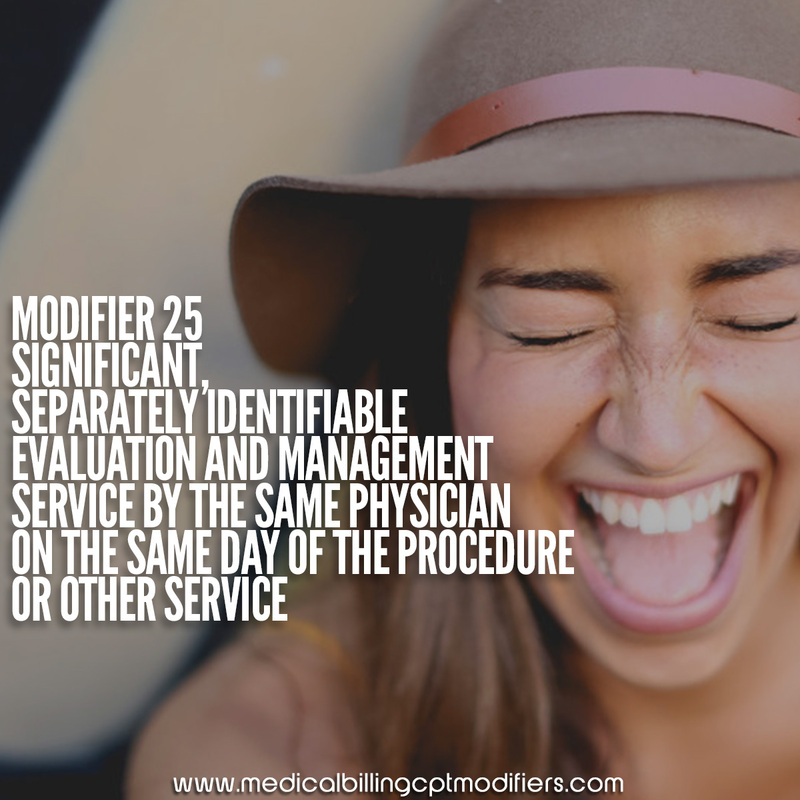 Modifier -25: Significant, separately identifiable Evaluation/Management by the Same Provider on the Same Date of Service of the Other Procedure or Service. • May be appended to an evaluation and management (E&M) CPT code to indicate that the E&M service is significant and separately identifiable from other services reported on the same date of service. • The E&M service may be related to the same or different diagnosis as the other procedure(s). • Modifier -25 may be appended to E&M services reported with minor surgical procedures or procedures not covered by global surgery rules. Since minor surgical procedures and global procedures include preprocedure, intra-procedure, and post-procedure work inherent in the procedure, the provider should not report an E&M service for this work. Patient is an 11-month old child who is brought into the pediatrician for a routine health check. At the time of the examination, the child is found to have an acute otitis media and is given a prescription for antibiotic medication. Note: Anthem Blue Cross commonly sees incomplete coding examples for modifier-25 as indicated above from the following physician specialties: Pediatricians, internists. Example #3: A patient is seen in the ED after a fall, complaining of shoulder pain. Radiological x-rays are performed. corresponding electronic version of the UB92. 4. Since payment for taking the patient’s blood pressure, temperature, asking the patient how he/she feels, and obtaining written consent is included in the payment for the diagnostic and/or therapeutic procedure, it is not appropriate to report a separate E/M code for these types of service. medical/surgical and/or therapeutic medical/surgical procedure(s). In other words, modifier –25 does not apply when no diagnostic medical/surgical and/or therapeutic medical/surgical procedure(s) is performed. · It is not necessary that the procedure and the E/M service be provided by the same physician/practitioner for the modifier –25 to apply in the facility setting. It is appropriate to append modifier –25 to the qualifying E/M service code whether or not the E/M and procedure were provided by thesame professional. Modifier –25 was effective and implemented for hospital use on June 5, 2000 (see PM A-00-07). This PM provides additional informational only in understanding how this modifier should be used; therefore, this PM does not change the original effective and implementation dates. services are provided by the same physician (or same qualified nonphysician practitioner) to the same patient on the same day as another procedure or other service. Carriers pay for an E/M service provided on the day of a procedure with a global fee period if the physician indicates that the service is for a significant, separately identifiable E/M service that is above and beyond the usual pre- and post-operative work of the procedure. Different diagnoses are not required for reporting the E/M service on the same date as the procedure or other service. Modifier -25 is added to the E/M code on the claim. “-25” compared to other physicians, has done a case-by-case review of the records to verify that the use of modifier was inappropriate, and has educated the individual or group, the carrier may impose prepayment screens or documentation requirements for that provider or group. When a carrier has completed a review and determined that a high usage rate of modifier “-57,” the carrier must complete a case-by-case review of the records. Based upon this review, the carrier will educate providers regarding the appropriate use of modifier “-57.” If high usage rates continue, the carrier may impose prepayment screens or documentation requirements for that provider or group. The office visit will need a -25 modifier. As for the -51, if you are billing Medicare, they automatically will add it when there are multiple procedures, we can use these modifiers. · The purpose of this modifier is to report multiple procedures performed at the same session by the same physician. · Modifier -51 (multiple procedures) must be used to indicate instances when multiple procedures, other than E/M services, physical medicine and rehabilitation services, or provision of supplies (e.g., vaccines), are performed at the same session by the same provider. Modifier 51 Guidelines: The surgical procedure with the highest allowable amount the primary (first) procedure. Medicare uses the RVU for this determination. · Multiple surgeries must be submitted by appending the modifier 51 to the codes with lower allowed amounts. · If the same procedure is provided multiple times and it is appropriate to submit the code twice, and the code has the highest allowed amount, then the code must be submitted on separate lines and append modifier -51 to the second, third, etc. line as appropriate. The primary (first) procedure must be on one line with one unit.